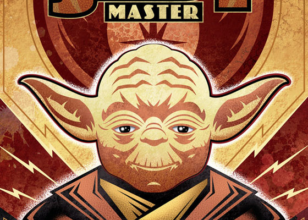 Yoda is a character in the Star Wars universe, appearing in the second and third original films, as well as all three prequel trilogy films. 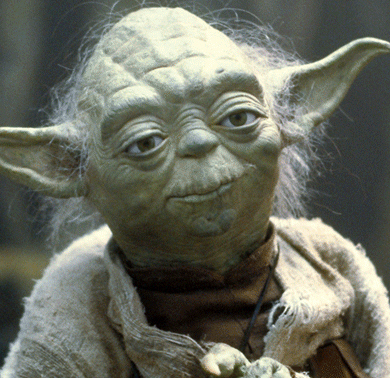 A renowned Jedi master, Yoda made his first on-screen appearance in Star Wars Episode V: The Empire Strikes Back where he is responsible for training Luke Skywalker in the ways of the Jedi. Best known for his diminutive stature and unusual manner of speaking, Yoda is a well known and well loved character in the Star Wars universe. 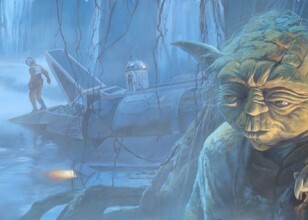 His final chronological appearance is Star Wars Episode VI: Return of the Jedi, when he dies peacefully at the age of 900. He also appears extensively in the two animated Clone Wars series, as well as the Star Wars Expanded Universe of novels and comic books. The diminutive Jedi master lives in self-imposed exile on the swamp planet Dagobah, after losing his duel with the Sith lord Darth Sidious. Whether he is waiting for a new Jedi to take up the fight against the Sith or has simply given up and decided to live alone and in peace is unknown. He ends up continuing Luke Skywalker's training as a Jedi after Obi-Wan Kenobi's death.